My role as an artist goes hand-in-hand with guiding others to develop a visual language in order to express themselves, at all stages of their artistic journey. I hold a teaching qualification (PGCE, Oxon) and have experience teaching at all levels from Primary to Higher Education. I’ve held various posts and fulfilled many roles including: visiting artist, artist-in-residence, tutor, lecturer and Head of Art (running two successful departments). • Foundation in Fine Art tutor, Somerville College, Oxford, summer programme. I regularly mentor artists in their studios and at Atelier St Louis, both in painting and printmaking, at all levels of their careers. I also carry out portfolio reviews for students studying for A’ Levels, Foundation courses and BA and MA degrees. 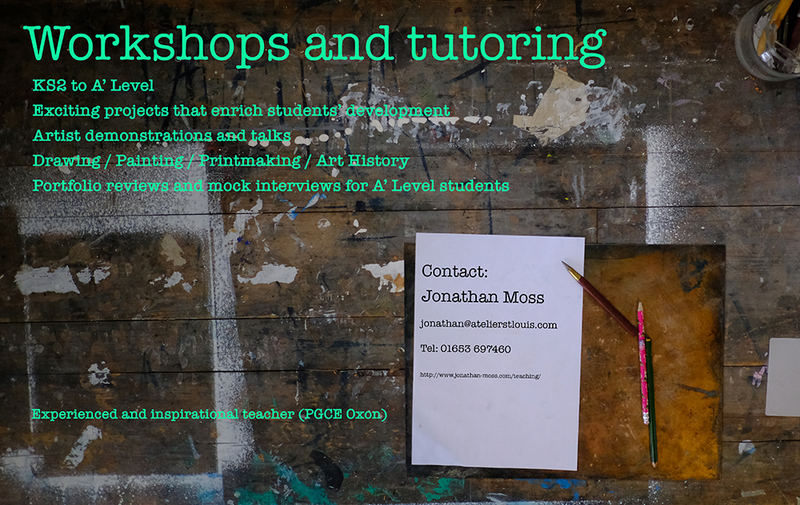 Please contact me if you’d like to work with me or see my teaching CV.